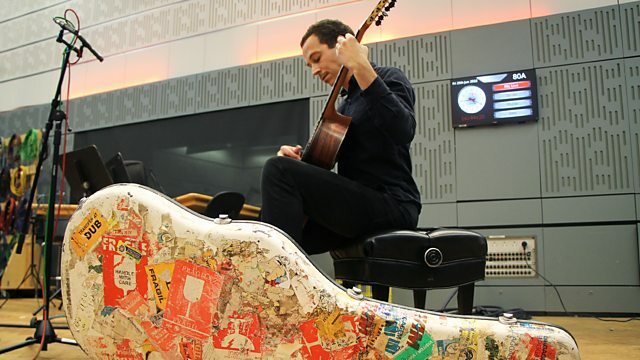 Katie Derham presents, with live music from guitarist Thibault Cauvin and Camerata RCO, a group of musicians from the Royal Concertgebouw Orchestra. Plus author Charles Elton. Katie Derham presents lively mix of conversation, arts news and live performance. Live performance today comes from guitarist Thibault Cauvin, who pops into our studio before heading north to perform at the East Neuk Festival in Fife. Camerata RCO, a group of musicians from the world-renowned Royal Concertgebouw Orchestra in Amsterdam, also play live for us before a concert at the Bradfield Festival of Music in Yorkshire, plus author Charles Elton chats about his latest book The Songs. Paray Conducts Chabrier & Roussel. Performer: Alan Booth. Singer: Paul Robeson. Ensemble: Ricercar Consort. Director: Philippe Pierlot. Performer: Alexander Melnikov. Performer: Olga Pashchenko. Gershwin / Saint-Saëns / Ravel - Benjamin Grosvenor - RLPO/James Judd. Singer: Gerald Finley. Orchestra: BBC Symphony Orchestra. Conductor: John Adams. Performer: Ben Dawson. Singer: Meow Meow. Choir: De Profundis. Conductor: Robert Hollingworth.